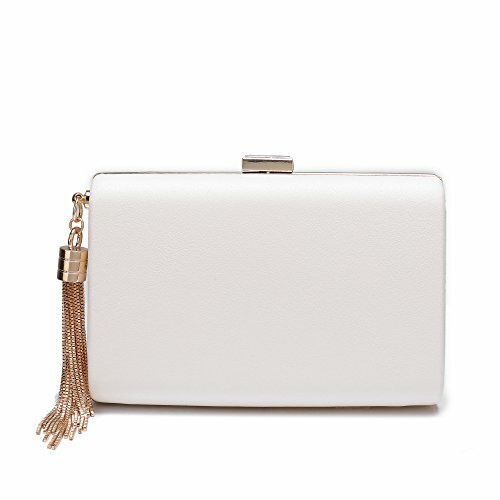 The glamorous evening bag in simple design and pure color yet reveal your noble temperament,it is your necessary for ball ,cocktail party,wedding party, etc. The evening bag is in metal frame covered with pure color. With 48 inch removable metal chain strap,can be used as shoulder bag or messenger bag. Stylish tassel decoration on the side of the bag. Large capacity contains iPhone7,cosmetic and some small uses. When stained with dirt, please dip it in soapy water with a soft sponge brush and gently wipe, and dry it in shade. Accept returns or exchanges if you're not satisfied with it for any reasons or have any problem with the product, please don't hesitate to contact us and tell the problem. We promise that we can give you a good solution in 24 hours. 【Good Materials】The leather evening handbag size: 6.7 in (L) X 2 in (W) X 4.5 in (H) CM. Chain strap: 48 Inch"(120CM), weight is 1.07LB .Made with high quality PU leather and hardware tassels, which is very fashion. 【COMPACT And SPACIOUS】 The cute evening clutch bag with perfect size to put a phone(iphone 8 plus), lipstick, mirror, perfume credit card, ID, lipstick, and other small essentials. 【 All-match Dress】 Smooth surface fit any magnificent dresses. stylish and perfect line design,unique design different from the other evening bags.Strong and reliable magnetic clasp closure keeps your belongings safe ,All metal parts are resistant to rusting, corrosion, oxidation and tarnishing. 【Vrsatilee Design】 - Clutch by hand, tote or crossbody bag use with detachable chain about 48 inch length. 【Many Occasions】 Unique design evening bag are perfect for wedding, night out, date, cocktail party, family reunion, prom, banquet and so on. If you have any questions about this product by Minicastle, contact us by completing and submitting the form below. If you are looking for a specif part number, please include it with your message.